A birthday to remember! 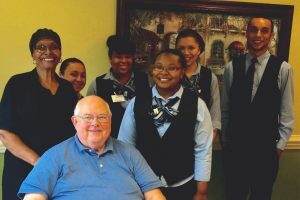 The South Village Dining Staff helps Jim Bundy celebrate in style. “I wish to give my compliments to everyone who was associated with this special dinner and to thank them for making my birthday dinner so memorable. It is certainly a birthday that I will not forget!” What a wonderful compliment to our staff in the Springmoor Dining Room. 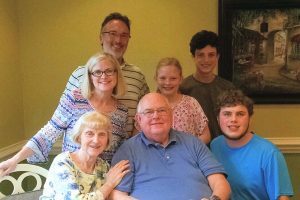 Jim Bundy and his family celebrated in style using our Premium Entrée Program Menu. This special menu can be ordered for lunch or dinner in our dining rooms on Thursday or Friday. It is the perfect way to celebrate a birthday, a graduation, a family reunion or an anniversary! This four-course meal – an appetizer, salad, entrée and dessert – are ordered when you make your reservations earlier in the week and then prepared to your taste upon your arrival. Jim and Faye Bundy celebrate in style with their daughter and her family. Our dining staff starts the meal with an appetizer and salad. The entrée course selections offer a crunchy coconut Jumbo Shrimp with a sweet orange sauce, seasoned Salmon Fillet en Papillote, Sea Scallops served with a browned butter sauce or a tender Beef Fillet. And these are just some of our delicious options on the premium menu! An assortment of vegetables and bread will always accompany the meal. And for dessert – everyone’s favorite – Springmoor’s melt-in-your-mouth, smooth and creamy cheesecake! Who can resist? “We had an experience on Friday that I feel compelled to tell you about. Last Friday was my birthday and so I decided to make use of the Premium Entrée Program for my birthday dinner. Several people had indicated to me that they had made use of this and had been very pleased but we just had not taken advantage of it until that Friday night. I have to let you know that my birthday dinner that evening in the South Village Dinning Room was one of the highlights of our almost three-year residence at Springmoor. And that is saying a lot because we have had many great experiences since we moved to Springmoor in September of 2013. From Chris taking the order, to Evelyn cooking our entrees, to Veronica and Janeth serving us, it was an outstanding experience. And to top it all off, the wait staff came over and sang ‘Happy Birthday’ to me! Thank you Jim (and family) for sharing your evening with all of us! Our Dining Services always looks forward to hosting your next event – whether it is a small intimate group or a large family reunion – our catering service and private dining rooms are happy to prepare something exquisite just for you! 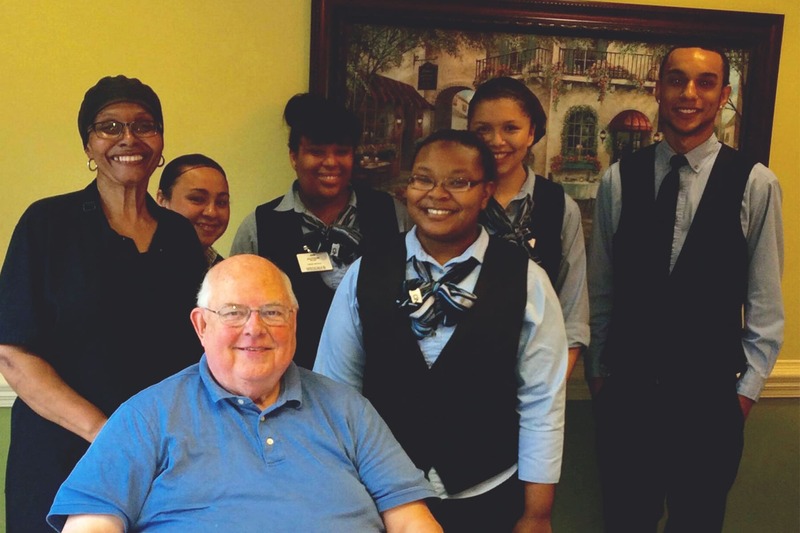 Luke Campbell, our new Dining Director, joined the Springmoor Dining Staff in July. He is looking forward to bringing his special touch to the event planning and menu offerings in the months ahead. In October, he will introduce an expanded Premium Menu. The Annual Dessert party in December is also in the works. As the staff prepares for the upcoming holiday season, they will certainly be introducing more of these wonderful Bon Appétit evenings to remember!